Exasperated Old Gentleman (to Lady in front of him). 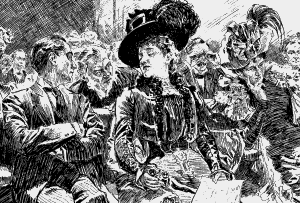 "EXCUSE ME, MADAM, BUT MY SEAT HAS COST ME TEN SHILLINGS, AND I WANT TO SEE. YOUR HAT ---" The Lady. "MY HAT HAS COST ME TEN GUINEAS, SIR, AND I WANT IT TO BE SEEN!"